Many see Rev. 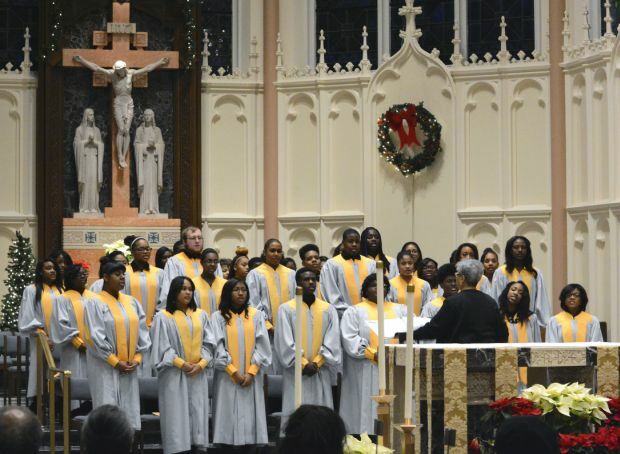 King’s vision ‘still in process of coming true’ in U.S.
Dixon, 15, is a member of the Wirt-Emerson Concert Choir that performed at the eighth annual King tribute at the cathedral Jan. 11. The high school student said black history today is loaded with stories of young black people dying. The cathedral event was held in observance of Rev. King’s birthday, Jan. 15. The federal holiday marking his birthday this year is Jan. 19. Joyce F. Gillie Cruse, guest speaker at the tribute, addressed those deaths, some of which have become household names, including Trayvon Martin, Michael Brown and Ferguson, Missouri. Noting how Rev. King’s fight for all races and against a system that promotes racism and racial divide, Gillie Cruse said Rev. King’s “vision is still in the process of coming true” decades after the civil rights leader was slain in 1968. These issues, Gillie Cruse said, include a low percentage of black voters, black teen homelessness, failing school systems, high crime rates, and unemployment or jobs that do not pay a living wage. Also, she said, only 26 percent of African-Americans get married. “We have some serious issues, and it’s not just the police,” Gillie Cruse said. An adjunct professor at Xavier University and Loyola University in New Orleans, Gillie Cruse previously served in the Diocese of Gary, working with Gary cluster parishes on adult faith formation and evangelization. Gillie Cruse suggested opening 24-hour community youth centers, keeping schools open at night, having leaders who address these issues, and church members allotting 10 percent of their tithe to promote children’s programming, including money for college. 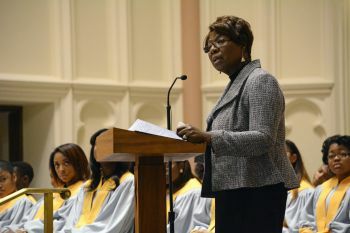 The annual King tribute included several selections performed by the Wirt-Emerson Concert Choir, comments from local representatives, and orator Troy Patterson Thomas’ rendition of Rev. King’s iconic “I have a dream” speech. Citing low black voter turnout in the last election, Father Mosley said, “We need to change our reality, so we can move forward.” Instead of talking about racism or black lives lost at next year’s King tribute, the Hammond pastor said people should discuss their accomplishments and additional work to be done. “Continuing tensions and violence in our communities remind us that although significant progress has been made in erasing the stain of racism and the cycle of related violence, we still have much work to do,” Archbishop Kurtz said. “As we consider the gains of the past and the challenges before us, I urge each of us to pray for healing and peace as we work for ever greater communion. Every human life has profound dignity, rooted in our creation in the image of God. We are one family,” he added. “More than 50 years have passed since Martin Luther King Jr. stepped into America’s racial divide of the 1950s and 1960s. Although that divide has eased in some important ways, recent events show that much remains to be done,” the archbishop said in his column, posted on CatholicPhilly.com, the Philadelphia archdiocesan news website. This year’s King observance “comes at a key moment,” he continued. “We should take advantage of it by reflecting on why King’s efforts to fight racial injustice bore such good fruit, and what his witness means for the United States today. Euvino is a staff writer at the Northwest Indiana Catholic, newspaper of the Diocese of Gary.